*This is the only part of the recipe I didn't measure. I just drizzled in a bit of honey since the recipe I was tweaking called for storebought orange marmalade and I was replacing it with lemon juice and honey. Pour the marinade over about 1.5 pounds of lamb ribs and let them sit in the fridge overnight. Then pour the whole mass into a covered baking dish and bake at 350 degrees Fahrenheit for two hours. It's far from mandatory, but I threw in a handful of asparagus spears for the last 15 minutes to take advantage of the extra juices. And after we ate the ribs, I saved the marinade/fat to make the base of some turkey burritos and Lucy munched up the bones --- nothing wasted! Our chicken waterer is the best way to keep your chickens happy and healthy. Everything I've read has said that's only true for poultry bones. The heftier bones from mammals don't seem to be a problem even when cooked. We are careful not to give Lucy cooked chicken bones, but figure she's pretty safe with cooked lamb bones! I didn't know that. Thanks for the info. Don't take my information as gospel, though. While checking my facts, I stumbled across a site that says that the USDA disapproves of us feeding any bones at all to dogs, raw or cooked. Personally, I think that's a little overboard and that bones are good for dogs, but there is some danger in even raw mammal bones. We tried this tonight. I ordered lamb ribs from my butcher, and made the marinade with a few substitutions. (chopped up orange bits for the lemon and maple syrup for the honey, apple cider vinegar instead of balsamic). It was very good but there was almost no meat basically 1 lb made enough for one meal for two people. I wonder if your ribs were very low meat or if it has to do with my butcher's lambs ( he felt there was so little meat he actually gave me the ribs for free because he did not believe there was any meat). I wonder if ribs might be better served by being boiled for hours to make a rich broth. It sounds like you turned the recipe back into closer to what it was before I messed with it. I'd say it was about half meat/half fat on our bones, and there were no leftovers here either. But we ate all the fat --- since our lamb was pastured, that fat is good for you. I did not seem much fat on the ribs. it was mostly bone with a tiny bit of meat between each bone and some connective tissue. The lamb was also grass fed. The ribs were a long strip probably the length of the rib cage and two strips were 1 lb. but the bones were cut so they were only ~4 inches long. I suspect that the more meaty/fatty upper part of the ribs is sold as a different cut of meat. We turned the recipe back to what it was originally because I did not want to go shopping so I used what I had in the house, and the fact it was originally orange marmalade gave me the courage to use fresh oranges rather than running out to buy lemons. Now that you mention it, my ribs were actually labeled "riblets". I looked that up on Wikipedia, and there seem to be riblets, button ribs (aka feather bones), and rib tips (aka brisket). Not sure which your ribs were --- maybe rib tips? I'm also not quite sure I understood the descriptions --- I clearly need to learn a bit more anatomy. 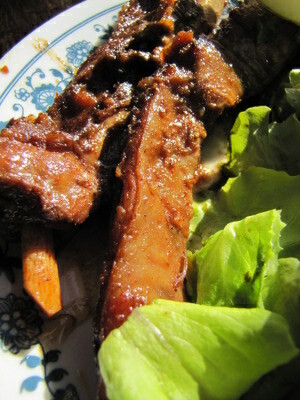 It looks like riblets can be any rib part but cut into individual ribs. It looks like what I got was short ribs. a short straight section of spair ribs left after you cut off the lamb breast and the rib roast, leaving the least meaty, cheapest collections of lamb meat/bones left. But at the price I got it (free) I am not going to complain. Hopefully now that I know the recipe is worth repeating i can get more of this cut inexpensively. And help out a local farmer that clearly is not able to sell this particular cut of lamb. He gave me a 2.25 lb package and had 8 more packages available if I wanted more. (he butchered a bunch of lambs for easter dinner lamb roasts) I think I should give him the recipe maybe he can sell more. That's a great idea about sharing the recipe! It's sad to think of any part of a pastured lamb going begging... Although pretty impressive that you got it for free.